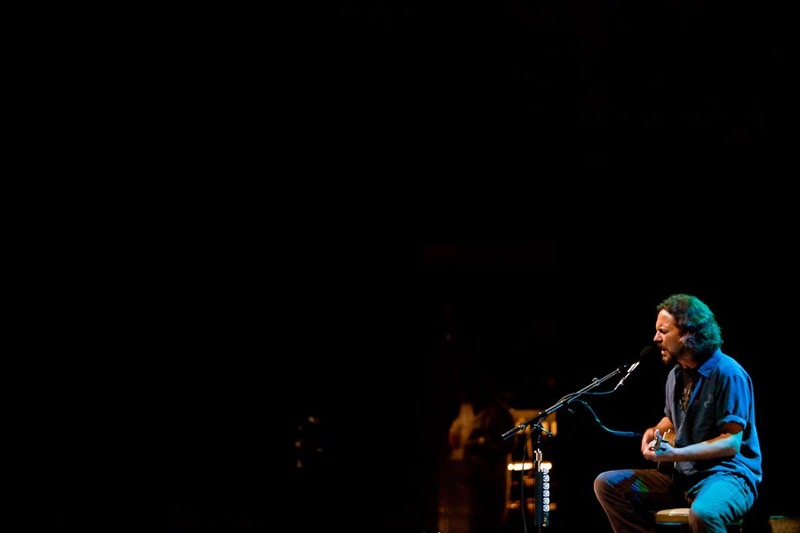 Eddie Vedder was clearly thrilled to be home after a long string of dates on his solo “Ukulele Songs” tour. 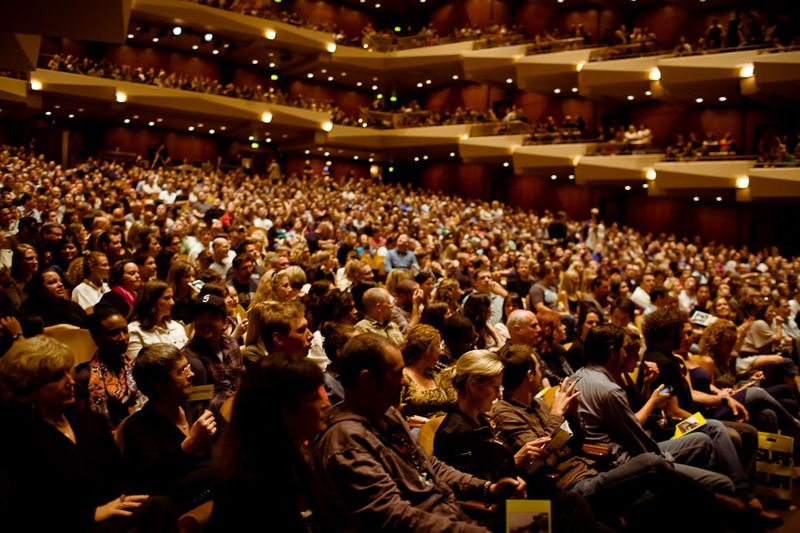 Speaking to the capacity crowd at the first of two shows Friday, July 15, at Seattle’s Benaroya Hall (the second was July 16), the Pearl Jam frontman said he was “anxious” to do laundry — yes, even rock stars have to do the wash – and reconnect with his hometown fans. He later said that if he didn’t already live in Seattle, he’d probably move here. The view from the stage was apparently a bit overwhelming, even to a seasoned performer who has faced tens of thousands of fans at a single show. 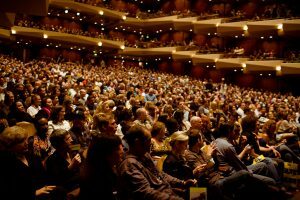 But at Benaroya, where concertgoers filled the main-floor seats as well as the many balconies, the view must have been surreal – like a giant beehive of fans. “If you could be inside my mind for a second, it would blow your (bleeping) mind,” he said. Nevertheless, Benaroya took on the intimacy of a much smaller venue as Vedder shared songs from his new solo album, as well as his first solo album, “Into the Wild,” and a variety of Pearl Jam tunes and favorite cover songs. He played ukulele, of course, as well as acoustic and electric guitars and a wooden crate (for foot thumps). Blessed with a delightfully craggy baritone that would make a reading of the Seattle phone directory enjoyable, the affable Vedder guided the audience through more than two hours of songs that expressed emotions both light and heavy. He began with “Walking the Cow,” as well as “Can’t Keep,” “Sleeping By Myself,” “Without You” and “More Than You Know” from the new album. 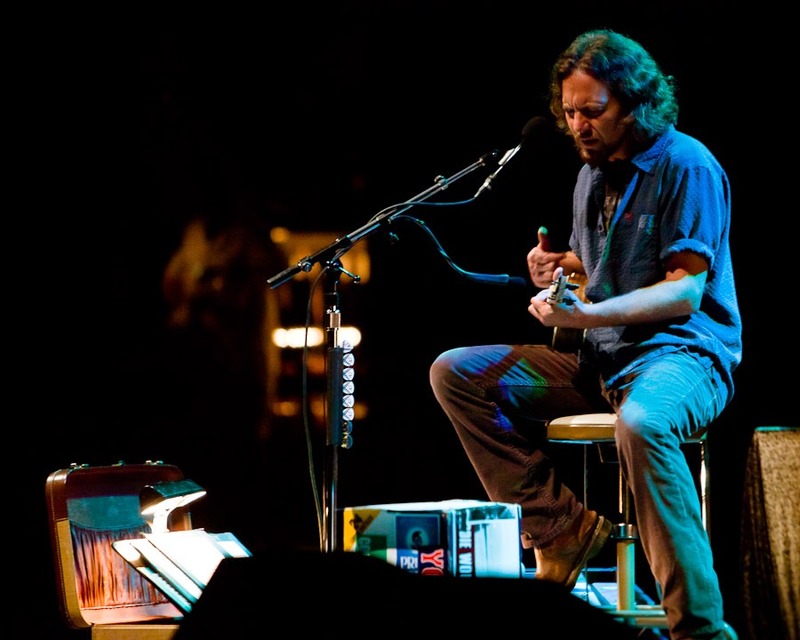 Vedder’s affection for the beloved uke was apparent from the start. The tiny instrument of Hawaiian origin (the name translates as “jumping flea”) seems to put all players and their audiences at ease, reflecting a softer side of popular music. Among the famous, the ukulele has been played by Abraham Lincoln, Arthur Godfrey, Walt Disney, Tiny Tim, Don Ho, Ledward Kaapana, Steve Martin, George Harrison, Eric Clapton, Jake Shimabukuro, Israel Kamakawiwo’ole and Eddie Van Halen, to name a dozen. Interest in the instrument has surged in recent years. Among my favorite songs in this extraordinary show were “Blue, Red and Gray” (Pete Townshend), a wonderful, upbeat version of “Betterman”; and “Arc,” which featured multiple layers of Vedder’s vocals – a stunning rendition that took full advantage of Benaroya’s acoustics (speaking of acoustics, Vedder’s voice wasn’t always clear when he spoke, and electrified segments seemed a bit muddy, at least from the middle of the auditorium where I was sitting). The concert came to a delightful close with “Dream a Little Dream,” the famous American song (featuring lyrics by Gus Kahn) first recorded by Ozzie Nelson and His Orchestra in 1931. Gene – Nice to see you at the show! YES, Eddie was great!